Facebook appears to be running a trial that features its subsidiary WhatsApp a lot more prominently in the main app. 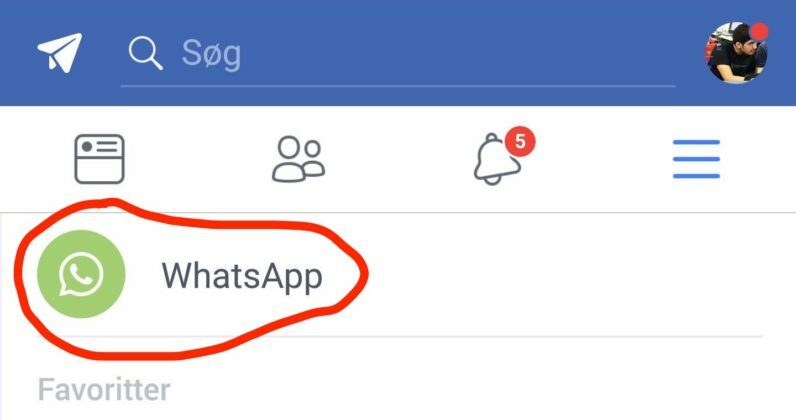 Users are reporting seeing a dedicated WhatsApp button in the main Facebook app on Android. When clicked, the button acts like a shortcut, opening WhatsApp without the need to leave the Facebook app. In case you were wondering, the dedicated button can be found in the menu area. If you happen to be one of the users in the control group, it should appear at the top, right under your name. But chances are not everyone will be able to see it yet. The shortcut is currently being tested on the Android version of the app, but it could very well be available to some iOS users too. According to Arvind Iyer, who tipped us off to this development, the WhatsApp button showed up after he switched Facebook’s language setting to Danish. This is not all that surprising given that the company has previously chosen Denmark for other limited rollouts – like its standalone video sharing app Bonfire. For context, this is hardly the first time Facebook has been experimenting with integrating its subsidiaries into the main app. In fact, the company was spotted testing a similar shortcut for Instagram earlier this month. Back in 2015, the social media giant shortly experimented with adding a WhatsApp send button in the Facebook app, so users can quickly share their photos and posts with contacts. The feature ultimately never made it to the official app though. As with any other test, there is no telling whether and when the WhatsApp shortcut will become available to all Facebook users.